With summer fast approaching, we are in the prime time of year for updating things around your home and preparing for all of the fun the coming season is able to offer. With the kids out of school, excellent cookout weather, and all of the holidays on the horizon, many homeowners out there are making the investment in brand new outdoor living upgrades for their home to enhance the way that you, family, and friends are able to enjoy your outdoor spaces. If you haven’t already started making these upgrades, then never fear, because it isn’t too late to start. If you are one of the many homeowners out there who enjoys spending time with family and friends in your outdoor spaces, but are looking for that special project to help take your outdoor gatherings to the next level, why not take the opportunity this summer to do so? To help highlight just a few of the excellent outdoor living projects that can help you take your outdoor gathers to the next level, our team of professionals have taken the time to put together this short list going over several of the more popular options, and the benefits they can provide to your home in the coming summer. If you are looking for an outdoor project that is sure to increase the value of your home, as well as help make an excellent impression on your guests this summer, one of the best places to start is with your home’s landscaping. Hardscaping projects, in particular, can provide you with a wonderful enhancement to your outdoor spaces, whether it is in the form of a brand new stone walkway, a new patio to host your outdoor gatherings, new stone flowerbeds, or a new retaining wall to help with drainage issues and give your home’s landscaping a unique tiered look that is sure to impress. You can even add something truly unique, like a brand new water feature, that is sure to leave your guests in awe. 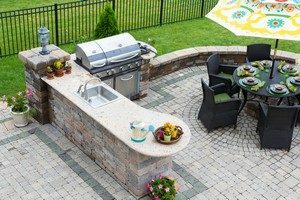 For the cookout enthusiast, there is nothing that can provide you with the same kind of value and outdoor appeal that a brand new outdoor kitchen can bring to your home’s outdoor spaces. With a brand new outdoor kitchen, you have everything you need to truly take your cookouts to the next level. This particular project will give your guests a central area in which to congregate, letting you serve as grillmaster while still staying right in the middle of the action, and eliminating the need to run back and forth from inside your home between the oven and your outside grill checking on different foods. You can even install an outdoor refrigerator, letting you keep everything you need right there within arm’s reach and letting your guests grab a fresh drink without having to head back inside to do so. As things continue to heat up during the coming summer months, there are going to be times where you find it difficult to truly enjoy your outdoor spaces simply because of the heat, and especially if your backyard has a lack of properly shades areas that you can sit. By installing a brand new arbor or covered patio, however, you can eliminate that problem and make your outdoor spaces an area you can enjoy at all times of the summer, no matter how hot it gets outside. This will give you, your family, and your friends with a comfortable place to escape the heat this summer with some welcome shade, and you can even install outdoor ceiling fans, giving you one more weapon in your arsenal to beat the heat this summer. 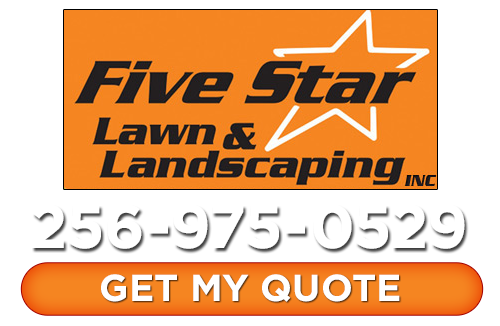 If you are looking for a professional landscaping company in the Huntsville area, give us a call today at 256-975-0529 or fill out our online request form.